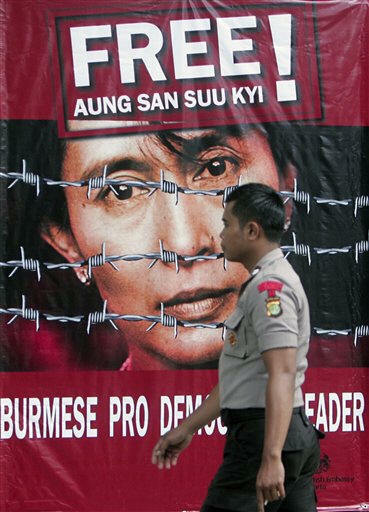 [February 26, 2010] YANGON, Myanmar (AP) -- The highest court in military-ruled Myanmar dismissed opposition leader Aung San Suu Kyi's latest bid for freedom Friday, turning down an appeal to end 14 years of house arrest, her lawyer said. The Supreme Court's decision had been expected since legal rulings in Myanmar rarely favor opposition activists, and the junta appears determined to keep Suu Kyi, a Nobel Peace Prize laureate, detained through elections planned later this year. Defense lawyer Nyan Win told reporters he would launch one final "special appeal" before the court after determining why the recent appeal had been rejected. 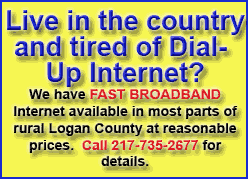 "The court order did not mention any reasons," he said. "Although the decision comes as no surprise, it is deeply disappointing," said British Ambassador Andrew Heyn, who attended the court session along with diplomats from Australia, France and the United States. "We continue to believe that (Suu Kyi) should be released immediately along with the other 2,000 and more other prisoners of conscience." French Ambassador Jean Pierre Lafosse said Suu Kyi was "the victim of a sham trial." Suu Kyi's lawyers appealed to the court last November after a lower court a month earlier upheld a decision to sentence her to 18 months of house arrest. She was convicted last August of violating the terms of her previous detention by briefly sheltering an American who swam uninvited to her lakeside home. The 64-year-old democracy icon was initially sentenced to three years in prison with hard labor in a trial that drew global condemnation, but that sentence was commuted to 18 months of house arrest by junta chief Senior Gen. Than Shwe. Suu Kyi has been detained for 14 years. Her National League for Democracy won elections in 1990 by a landslide, but the military, which has ruled Myanmar since 1962, refused to cede power. The junta has announced it will hold elections some time this year under a constitution that allows the military to maintain substantial power. 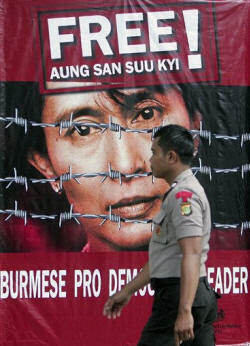 It effectively bars Suu Kyi from participating in the polls, the first general elections since 1990. Suu Kyi's party has not announced whether it will contest the elections. If the vote goes ahead as planned and Suu Kyi serves out her latest 18-month sentence, she would still be in detention during the elections. The court ruling also denied freedom to two female companions who share Suu Kyi's house arrest. It comes nearly two weeks after the junta released Tin Oo, the 82-year-old deputy leader of Suu Kyi's party, from nearly seven years in detention. Myanmar, also known as Burma, has been widely criticized for its continued violation of human rights, including atrocities committed by its military against ethnic minority groups. Human rights groups say the junta holds 2,100 political prisoners. The Singapore government, which normally refrains from criticizing the junta, said "it is of course very disappointing that her appeal did not succeed." It said a dialogue among the junta, Suu Kyi and all other political groups ahead of this year's elections "offers the best prospects for national reconciliation and the long-term political stability of Myanmar." "We thus hope that the Myanmar authorities will, in their own interests, allow her to participate in the political process in a meaningful way as soon as possible," it said in a statement. "Than Shwe already made the verdict for (Suu Kyi) and no judge will have the nerve to change it," said Aung Din, executive director of the U.S.-based U.S. Campaign for Burma, a lobby group. "The judiciary system in Burma is just a part of the regime's oppressive mechanism," he said. "The only way to make the release of (Suu Kyi) and all political prisoners in Burma is to keep putting maximum pressure on Than Shwe and his cronies until they feel the heat."